Welcome! Well,I don't have many rulers. So today finds me wondering how everyone else stores their rulers? Do you hang them? Do you have one of those cool wooden ruler holders? Or do you just have a few "go to" rulers? I hang my rulers on a peg board on the wall behind my cutting table. We bought a 2x4 ft board and all my rulers fit nicely on there. It is nice knowing they are always where they should be. My scissors and rotary cutter also hang on this board. I like the pegboard idea, Dee Dee. Valerie, you're so good at finding thrift store bargains. I love how the bin and dresser fit perfectly under your cutting table. I only have one or two rulers, and they can normally be found where I was last working with them. Yeah, I've got to hurry up and get more organised. No you don't. Serious...I have my two go two rulers and only use the 24" ruler when I need to trim....I'm finding I'm becoming a more out of the box quilter...we'll see as time progresses...I've only been at this for four years. I have a wood stand for my large rulers that a quilting friend's husband made me. I store smaller rulers in assorted containers or with WIP's. 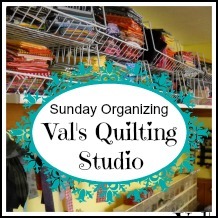 I hang mine on S hooks from towel racks attached to the end of my cutting table. Usually my 6.5 x 24.5 and my 12.5 rulers "live" on my table! I thought of those wood stands,but fear I'd never put the rulers back! (HAHAH!) and love the S hook idea!! Thanks for sharing!!! My most used rulers are stored in what I call a "letter sorter" which I found in a thrift store. It's made of metal and has several divisions which can hold more than just one ruler at a time. Other rulers are hanging from nails on a wall inside my "fabric pantry" (closet). I love the letter sorter idea too!! As I read this I invented a deep quilt sleeve sort of thing for my rulers at the next house... still unknown. It'll have to be deep enough for the widest ruler, 8n1/2, and have some length to support the 5"x24". Now how to hang it, maybe just thread some cords at the end and hang by two nails or hooks. I've got time to reckon on that one. Might be the next house has no space for such a device. Before I packed up the sewing room I kept the rulers behind the cork board that was tilted on the back of my cutting board. Love this revisit of your organization blogs.